I have worn foundation for as long as I can remember. For most of my life I had a face full of acne and so you can bet your bottom dollar that I have tried every single foundation you can think of to cover up the unsightly marks. A few months back, I decided I needed to change up my foundation (again!) and so I went to my local department looking for inspiration. After a quick walkaround the makeup counters, I found myself back at Estee Lauder sampling the holy grail that is Double Wear. As I sat in the makeup chair, I explained to the assistant my predicament of needing full coverage foundation due to my horrendous skin. Her response was one that I was not expecting at all, because she looked at me and insisted full coverage was far from what I needed because according to her my skin looked great! Bearing in mind, I had been on Roaccutane for about 4-5 months at this point and my spots had actually stopped forming, it was was actually only the marks and scarring I was left with. The wonderful sales assistant then introduced me to my new favourite face paint – Estee Lauder Double Wear Light. The foundation is medium coverage and the consistency is a nice creamy liquid that you can easily spread and blend. I love that the coverage is buildable so you’re able to even out your skin tone and cover up any imperfections without too much work. It doesn’t feel heavy or “caked” on when you do build it up either which is something I sometimes struggled with with Double Wear. Once it’s on, it does take a little while to dry and set but give it a few minutes and you’ll see that it has a beautiful matte finish. 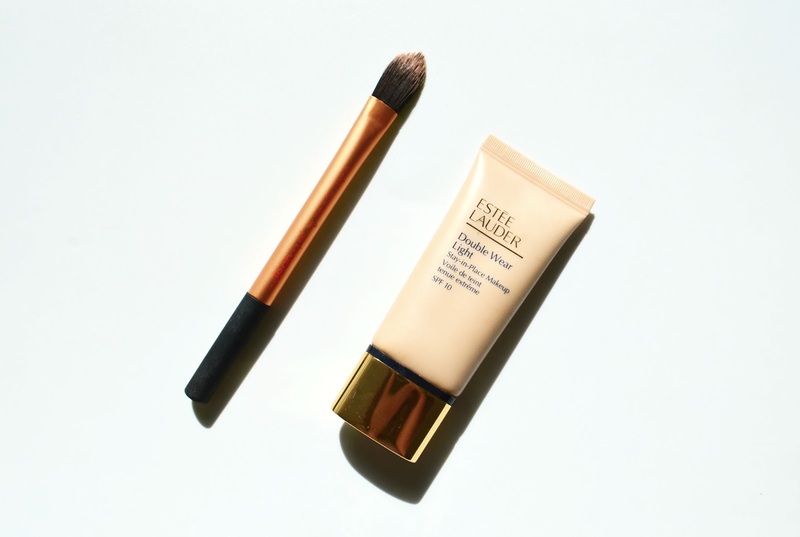 Estee Lauder promise 15 hour wear with Double Wear Light however for me personally I get about 8 hours before I notice that I need a touch up. It does however stay on during my entire work day so this has quickly become my firm favourite for when I’m working. I’m always wary about foundations with SPF and I do try to stay away from them. Now before you get all judge-y on me, the reason being is that I prefer to apply sunscreen under my foundation myself before putting on my foundation. I find that when foundations have SPF mixed in, it gives my Indian skintone an ashy look. Double Wear Light has SPF 10 which is a very small amount. After a great deal of selfie taking, I can confirm that this amount of SPF does actually work fine for me. Plus, if you don’t wear any SPF at all, a little is better than one. The packaging is one of my favourites for foundation. A squeezy tube! No more faffing around with a pump that gives out too little or too much. Be gone, heavy glass bottle that I can’t carry around in my handbag and hello to being able to squeeze out every last bit of your money. Estee Lauder have got it 100% right with this foundation. It literally is everything you would need in a to create a flawless base and it most definitely is the perfect product for those of us that are constantly on the go. Have you tried Double Wear Light?